We have concentrated all our know-how and our dedication on the conception of this delicate and sensual cream jewel. 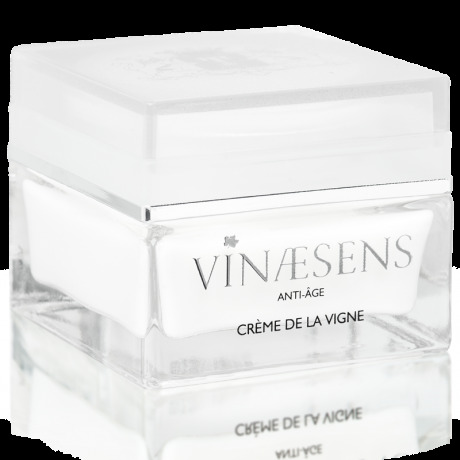 Rich in split hyaluronic acid, in polyphenols from grape seeds and in natural resveratrol, Cream de la Vigne is a complete anti-ageing treatment, uniting three of the most widely recognized active principles for their action on all cutaneous signs of ageing and for in-depth improvement of the youth and beauty of your skin. All our products are based on: Split Hyaluronic Acid, Resveratrol and Polyphenols. The cream is applied by lightly massaging the skin with the fingertips following the application of the Elixir de la Vigne. Please note: our products have colours ranging from white to beige because of their high concentration of active principles. To strengthen, moisturize and restore full radiance to the skin of your face and your neck with the silky textured Crème de la Vigne: apply it simultaneously with both hands from the centre of the face outwards. To multiply the effects of your care and relax your facial features, next repeat the following movements three times each with two fingers: the middle and ring fingers. Make circular movements from the chin to the ear lobes, corners of the lips to the ears and then from the nose to the temples. Make semicircles around your mouth starting from below the mouth. Make circular movements from the centre of the forehead to the temples. To smoothen and restore the elasticity of your skin, press with the palm of your hands following the contours of the face and nostrils to the temples, and finally from the centre of the forehead to the sides of the face. In order to redraw the contours of the face, apply pressure with your fists from the chin to the ears. Spread our rich Crème round your neck and smoothen your skin from the chin to the bust.